chilly in southern cali huh? today in nyc it was 21 when i came in to work and there are like 35-40 mph winds...so it is much colder than that. UGH! i hate this weather. today i'm dressed like an eskimo. anyway, i actually like the cheaper version better. the ruffles look more frilly. Do you realize how often i make fun of sweater vests? A lot! Too much actually and now you've gone and given me a reason to kinda like them. I like the Juicy Couture one! Vest for less definitely dear Erika. I kinda like the ruffles on the 2nd one better. 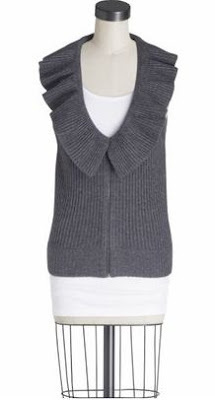 I LOVE the Shopmamie's Deep-V Vest!! I want this! It is adorable! And the price is so right, on the second one that is :) I'm a tightwad. Love that deep-V vest. And up here in Vancouver I've been channeling Mr. Rogers like there's no tomorrow. Old man chic, ya know? This is such a great piece to share with us ! Hey Erika! So I've been gone for a bit and this is the first time I'm seeing your photo!!! Just wanted to let you know you look gorgeous!! It's great to put a face to the beautifully written posts!! So adorable! Nice finds, all! This makes me want to wear vests even though I can't (broad shoulders and not so lanky arms). I love the ruffle and the color. I am always cheap and proud of it. Did you have a fabulous Christmas? 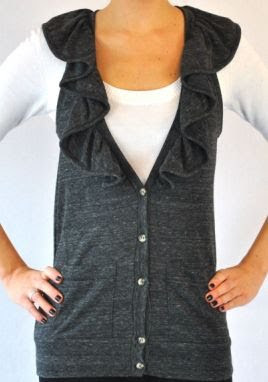 I love the ruffle vest! Very great trend spotting. I'm trying new things in 2010 and vests are at the top of my list! RYC - I know, chocolate and friends are fabulous and can get you through anything! Both are gorgeous! Of course, I'm much more the thrifty shopper. Bargain Betty! oh no.. don't, don't buy this. it's awful! -gray, dull, uninteresting. you deserve better. I love the Shopmamie option...especially at that price! I actually like the Juicy Couture vest and the Shopmamie vest. So, how about I just take both? Lol. :) For one, I love gray. And two, I absolutely adore ruffles! Such perfect vests! Love the picture of yourself you added! It's nice to be able to put a face to the blog. Plus, you look gorgeous! Loving the boots! Mr. Rogers or not, I am absolutely obsessed with vests! That juicy vest is incredible. AND I am crossing my fingers for the Twenties Girl giveaway!!! The Juicy Couture sweater is actually really cute. Although, its definitely too expensive. I'm going to be a tightwad and go for the cheaper option, which is still really nice. cant do wrong with ruffles - i love them both! Ahhh I really adore that style of cardigan. The ruffles are just so pretty. Call me crazy but I would prefer the more expensive one (blame my mother for my expensive taste)though both are gorgeous. Alright I was only kidding, the fluffy sweater is strangely stylish...I think I want one. LOVE the thrifty version. It's super adorable! As if there was any doubt that it would be. You're the best E! Ohh good find, they look very similar! love the sweater vests! I actually saw a couple of really cute ones on Etsy and they have inspired me to make some out of old knit cardigans. i love when my man wears his mr. rogers sweaters :) and the ruffle deep-v vest is even cuter than the more expensive one i think - love when that happens! very cute vest! Plus, I love the pics of you on your side bar! You are too cute! Great budget alternative! I am all about finding "the look for less" if I can. No reason to drop triple digits on trends if you can help it. you're always so sweet in your comments :) and i love the vest for less post! ruffles are my favorite this season (and lace!). I really like the juicy couture one better so this time I am a high spender! I actually like the cheaper one better! The buttons are more flattering. Great find! I love Shopmamie's Ruffle Deep-V Vest way better tha Juicy's and it's way cheaper!